Dr. Sonjia Kenya and her CHAMP team pictured from left to right: Zachary Gardner, Jenny Estinville, Sonjia Kenya, Jakisha Blackmon, BreAnne Young, Sebastian Escarfuller, and Brian Davis. CHAMP utilizes community health workers to facilitate a service program that provides HIV testing, education, linkage to care, and advocacy to reduce HIV incidence and improve outcomes among African-Americans and immigrant Blacks in Miami-Dade. It is a program that has grown over the years from a simple research idea to a service program that goes beyond just testing but aims to help populations that are at the greatest risks for contracting and dying from HIV/AIDS through education, prevention mechanisms and care services. The new funding will transition CHAMP into a true partnership with the FLDOH and strengthen PrEP and PEP (pre-exposure and post-exposure prophylaxis) linkage services, which are underutilized in Miami’s minority communities. “The CTSI recognized the promise of a non-traditional, community-based researcher translating clinical advances to our vulnerable communities and because of that, the true vision of the CTSI has become a reality through this DOH award,” said Kenya, who is also a Research & Education Officer with the University of Miami’s Office of Diversity and Inclusion. In 2012, the Miami CTSI was formed to drive research translation into evidence-based clinical and community practices that improve the health of South Florida’s diverse population. To accomplish this goal, it sought out to fund innovative clinical translational research projects that also addressed health disparities. It was around this time that the FDA approved a rapid home-use HIV test kit and Kenya wondered could you use it to increase HIV testing among African Americans – a population in Miami who saw HIV/AIDS as the leading cause of deaths among adults 25-44 years old. The CTSI funded Kenya’s proposal through its Pilot Program and the study went on to show feasibility. From there, Kenya went on to receive funding from the Elton John AIDS foundation to translate her research findings into a service program using community health workers in the Miami neighborhoods of Liberty City, Little Haiti, and Overtown – expanding HIV testing and education to immigrant blacks as well. “It wasn’t just about testing. It was getting them linked to care, getting them to adhere to their medications, getting them healthy, and hopefully turning them into educators themselves,” said Kenya. Targeting Miami’s immigrant blacks for this program was important, Kenya said, because they often face unique barriers to testing and treatment due to language, religious and cultural differences or immigration status. 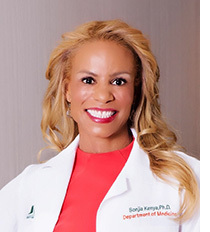 For example, in her prior work, Dr. Kenya learned that with the Haitian population, verbal and visual educational materials can be more effective than written ones. This is where community health workers can play a key role with culturally specific messaging. Additionally, many undocumented immigrants don’t think they can get care or even afford it while others fear deportation if they test positive for HIV. Kenya’s team helps them understand what their rights are and connects them to important services. Since CHAMP began, demand for services has consistently increased as well as engagement from the community to increase awareness of the services. Some people, Kenya said, open their homes as temporary testing sites or give transportation to neighbors to get PrEP or PEP. Once a month, Kenya and her team host movie night in Liberty City where community volunteers help with setup and food and distribute HIV informational packets. Since December 2016, the CHAMP program has tested 1,364 people and provided 4,383 local residents with HIV services, including education about HIV risk behaviors and access to preventive resources, such as PrEP, PEP, and other protective barriers.